There is no doubt that change is happening now and things are continuing to shift on a physical and energetic scale. Tune into from the Guides and Angels of the Light. 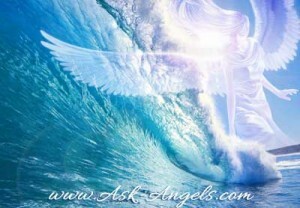 Simply relax, breathe, and listen to this free angel message to cleanse and uplift your energy to more fully tune into the love of the Angelic Realm. Greetings, we are here, guides and angels of the light. We are vibrational beings, light beings and we are here merging our energy as one, to assist you in your now, amidst the great shift, the great changes on your planet. It is clear to us and to many of you now, that your world, your earth is indeed, in the midst of transformation, shifting and changing as waters rise an old regime spa on a global sense and in your personal life, the old comes up to be released to make way for new. This is the same thing that is happening to your planet and indeed, in the entire universe you live in a time of great change, of evolution, of ascension. You may feel as though your life is crumbling around you as change flows in from every angle. Indeed, it is a natural response for humanity to respond to change with fear, to respond to the unknown with fear. Breathe. Breathe in the air around you, deep breaths, deep into your belly, filling your body, with life force energy. Find your center, ground it. Peaceful state, the state within that cannot be explained, but rather felt. Feel your heart open, feel yourself enter into your internal being, your inner realm in your heart. Open and relax into this now and into the powerful energy of light, of divinity that does indeed, exist in you. Open your heart to feel your vibration raise. There is much talk in your realm in these days about technology and many of you would consider yourselves to be technologically advanced. There is always room for growth and we wish to draw your attention to the miraculous technology of your body with which your science and your species is barely beginning to understand. The technology of your heart when opened, when centered, allows you to connect beyond the physical realm, to connect with your light in the realm of spirit. Indeed, you have become aware that you are a physical being, yes. But you are spirit and you are source. And when you use the advance technology of your heart to open, to feel, to commune with the divine, you make the great power of an open heart available to you in your now. The transformation on your planet is not meant for you to struggle through with no reward at the end. Indeed, you are evermore presented with opportunities to rise above all your limitations. Through your open heart, the power of love fully becomes accessible to you. In this now, your heart open, your mind calm, your energy expanding and merging with the divine. Feel refreshed, feel lifted and simply be. Be present now, release your worries your struggles about the many changes, things in your reality that are crumbling and shifting and evolving. The natural tendency is for you to want to know how, to clearly know everything that will, can and has happened in your life. But we say to you, there is great power in your simply surrendering to the power of love, the power of the divine. And when you surrender, when you open your heart and say, “I surrender, I trust in the process of life, I flow with the creative love of the universe,” then beloved one, your power is accessible to you. This shift on your earth, echoed throughout the entire universe has been planned and indeed, is divine. You may feel as though, you are being tested and challenged and that this is a time of great struggle. But remember that there is a higher purpose, a higher plan in line. Take a moment to imagine the moon. And now imagine that you are standing on the moon, gazing down to earth, off in a distance you can see the blue planet, the beautiful home on which you live. Imagine this, looking down at your earth. And now as if you have a high powerful camera, begin to zoom in on earth, specifically zoom in on your life, viewing your life now from a completely outside perspective, a completely new perspective. Zoom in and notice how you relate to the world around you. Are you trusting in the process of life, flowing through your life’s lessons, mastering love in the now? Or are you still buying into the illusion, the struggle, the fear that has plagued humanity for so long? How are you being impacted in your now? And however you see yourself, it is likely that you are able to now see area for improvement, area for growth, ways in which you can be more fully connected to love in your life, connected to peace, connected to balance, to joy. This is the ultimate calling for you in your life, the purpose of this great transformation, this acceleration of energy, this ascension with which you and your planet are undergoing the old paradigms of manipulation and fear and doubt that have limited you, limited your species no longer serves you in your growth. You are at the era of a new becoming, leaving behind the dualistic means of relating to the world, good and bad, right and wrong, light and dark. Your ego mind has served you in learning these lessons of duality. But we say to you now, you are moving away from this. And as in leaving anything behind, there can be resistance, there can be struggle. So leaving behind your fears and doubts, your dualistic approach to judging, the world around you naturally grips on. And yet, a great flow of energy from cosmic consciousness, from the center of your galaxy is intending now. But you as a species and you as an individual being, returned to the full knowledge of your power within, your connection to everything and your ability to influence the world around you with your thought, with your heart, with your inner intentions, your inner world, shapes the outer physical world around you. As we have said, there is a flow of conscious energy onto earth, a wave, some may say. And your lesson is learning to ride this wave, for as you do, you can ride above the fear, the doubt, the destruction. You can stay in love and this, this allows you to integrate the new conscious energy on earth, allows you to move towards your true purpose, your true intentions. And do not overthink these things, but rather, understand that you are here on earth to evolve, to continually grow towards integrating your spiritual self into the physical. To remember your inner power, to create blessings and beauty in your world, this is the energetic flow, the opportunity available to you now, by the riding the wave, by opening your heart, by trusting in the universe and by staying connected to love. And of course, when you find you are being submerged, when you find you are not riding on top of the flow of life force energy, but being drowned in it, giving into fear, giving into worry, giving into the illusion of suffering and pain, observe, take note, notice what brought you to this state, what area of your life does not serve you in staying in love, in staying in the higher realms and in peace. This area of life, well, it may bring you money, well, it may bring you physical worldly pleasures or benefits, if it negatively influences your ability to stay in love, it is time for you to release. The time force struggle has passed, dear one. You in your now, can ride the wave of light, can stay connected to your heart, to synchronicity and to love, bringing into your experience, joy, authentic connection with others and radical positive change, bringing your world, your life back into balance with all beings, all creatures, with your earth, balance, connection, love. The powers that be, will continue to try to hold on to scare you, to convince you that you are not safe, that the world is not safe, that reality is crumbling around you and that you should fear, that you should worry, that you should give in to negativity, for there is no other solution. But we say now, of course there is. And indeed, this shift is all about returning you to power, returning you to your light and your ability to authentically love yourself and all. Seeing through the illusion of the world and recognizing the truth that all is divine, that you are living in the midst of a great shift and that there is incredible support to you within your heart, within the inner realms of light and truth and love. Release struggle, release doubt, release your fears and believe that you are guided from your internal system of knowing. Your feelings, your emotions, point you in the right direction. Follow your heart, return to joy and know that although yes, you are challenged now, yes, there is much that is changing and shifting. But all is divine and you are moving in the direction of realigning with your authentic truth. Let this motivate you to keep going, to stay focused on opening your heart, on seeing through the illusion and on living the life of love that you were meant to be, that you chose to be here on earth to experience, radical, powerful, sustaining love. Enter fully into this now and know that a powerful energy indeed exists to support you. Open your heart, breathe, be and allow these energies into your experience. Love to guide you, hope, peace, well-being, physical vitality, compassion, authentic connection. This is what you are moving towards. Balance with your earth. Balance with all beings. The increased energy at this time on the planet amplifies your power of creation. And so, you have a choice and truly what you’ve focused on now, begins to manifest in your experience. And so, allow your ideals to manifest by focusing on your internal, your true desires. What do you want? Focus on the joy, focus on the connection, focus on the love and your blessings, your desires, your intentions will begin to be created in the physical realm, beginning with your internal shift, surrendering your mind, opening your heart, trusting and flowing with the universe. Let joy guide you, let love be your shining light and let yourself go to flow on top of this wave of energy. Not being carried under the current, not being dragged into negativity or doubt or fear. When these come up, release them. Imagine that you are riding a golden surfboard of light and cruising effortlessly through the changes, flowing with the light. Beloved one, now is powerful for you to create change in your life and on a global scale. Open your heart and radiate love to bring about the highest, most loving, most beneficial possible situation, circumstances and manifestations in your life. Release struggle, release your fear, trust that a greater plan is in effect and flow with this truth, with this light. Open your heart and keep it open to integrate the new frequencies present on your planet. We invite you to join us during the equinox from a place of open heart, to declare your commitment, your unity, your oneness with all of creation and to claim your power, integrating the new frequencies from your sun. Intend to manifest blessings in your life, allow yourself to dream big, to hope for a brighter tomorrow. And truly from your inner world, from the inner peace and love and calm of your open heart, miraculous blessings are possible. Great changes in your world will come to be, so long as you trust, remain connected to love, to open heart and to hope. This is your purpose now, to release the old and to rise into your power as a conscious creator, a human being filled with light and connected to authentic spirit, to source. ou have all you need inside of you. Open your heart, connect with this light. Integrate your spiritual being into your physical reality to allow the blessings, the love, the happiness and the peace you so desire to be your primary experience. The energies of change support you in this now, but you must choose to accept, to be loved. And indeed, through this choice, all things, anything is possible for you. Open your heart, feel the light and the love all around you, feel your connection to the universe, to your angels. Stay in this light, ride the wave of accelerated energy to manifest blessings, positive change and hope for your future. We love you, we assist you and we leave you with our blessing.